July 14th , 2009 - No real story to go along with pics below. 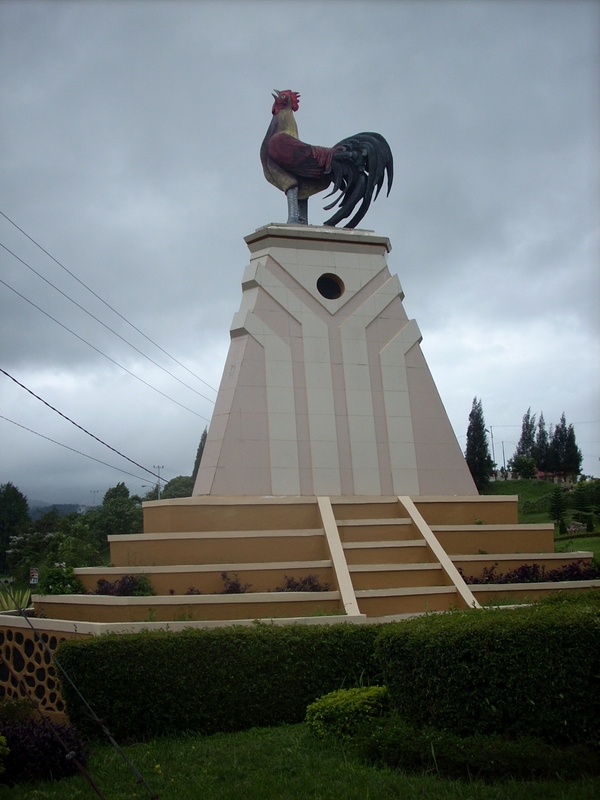 I was driving along and I came across this monument to poultry. 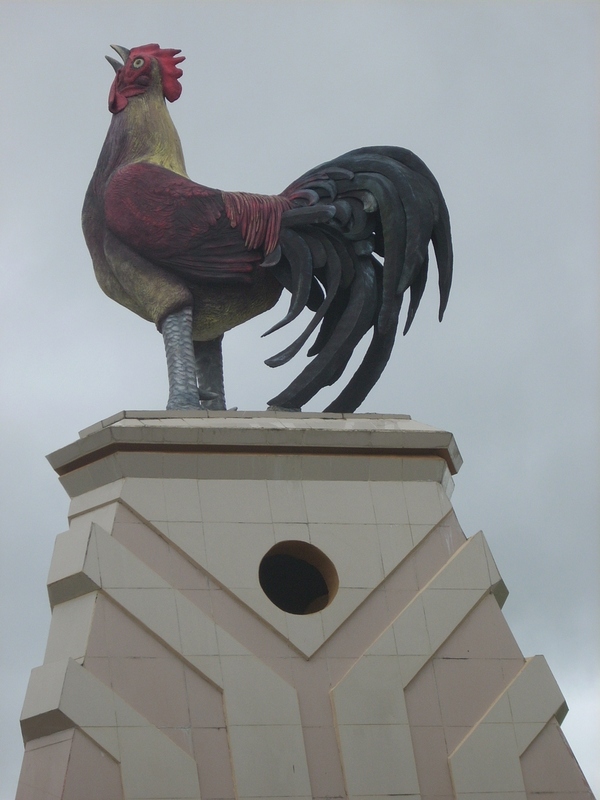 Failing to capture this bizarro tribute to barnyard fowls would have been criminal. When I first noticed this statute all I could think was 'Behold! The CHICKEN!!!!! 'I made inquiries but received an incomprehensible explanation. Honestly, I prefer not to know. The mystery is so much more intriguing. My longing to see a tiger led me to a most peculiar encounter last night. There is a restaurant (Turret Cafe) in Bukittinggi that also arranges tours. There are some interesting characters milling about the place on any given day. Over the past couple of days I have been speaking with one such individual about the possibility of finding Winnie the Pooh’s faithful companion. He has been telling me that he knows a guy (there’s always a guy) that might be able to assist. Apparently, there are those that have the capacity to 'summon' the beast paranormally. Alrighty. Not far from the center of town lives an elderly gentleman with experience in such matters. According to my new friend it would be me, the old guy, and a spirit man going into the jungle to call on the kitty. Spirit man? Well, how the hell else do you call a tiger? Duuuuuuh. My skepticism was running deep but on the other hand curiosity dictated investigation. I was also told the encounter would set me back somewhere in the neighborhood of $450 US, $100 of which would be dedicated to the acquisition of a sacrificial goat. I was also informed that no tourist has ever been a party to this ‘ceremony’ and that it is normally undertaken to hunt/capture a tiger. The old gentleman has been known to bring down the big cat on occasion as did his father before him. At this point I made it abundantly clear that I have no desire whatsoever to harm the animal and that my interest is solely in viewing the beast. He seems to get the picture and agrees to set up a meeting. I should mention that the man to whom I have been speaking seems, for lack of a better word, touched. His expression never changes and he is one of the least excitable people I have ever come across. I am not sure the nearby detonation of a nuclear warhead would get a reaction out of him. On top of this I find it very difficult to understand what he is saying. I understand the words but the overall meaning often eludes me. A perfect the recipe for an interesting rendezvous. As the guy’s house is close by we opted for a stroll. We meandered our way down a poorly lit residential neighborhood for about ten minutes. If I was not in Indonesia and did not know better this would have been a tense moment and expecting an ambush would normally not have been a outlandish thought. However, all was well. We arrived at the house, were greeted at the door by the 70 year old tiger man, and invited in. We sat on his couch and reality began to bend all around us (at least as far as my perception was concerned). As I sipped local tea the high level talks began. There are eight tigers in West Sumatra roaming across 18 or so different districts (No clue how they know this). Due to the large area, small number of tigers, and their roaming tendencies I am told that it is extremely difficult to summon a tiger. Got it. One spirit man is not going to cut it. We need two. And one night is insufficient. Fifteen days may be required to get the job done. 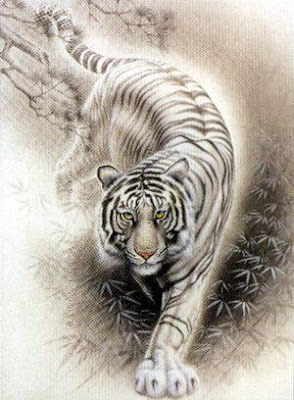 It will require an enormous amount of energy to summon the spirit of the tiger and all parties must believe in the process, including myself. I was asked if I believe in spirits to which I replied in the affirmative (as if I had a choice). Each spirit man costs about $6 a day. Until the goat is actually killed it is considered a rental, $2.50 a day with $70 payable upon its slaying. Food, transport, lodging bring the total to around $350 for the two weeks ….probably. Our lodging would be in the jungle near a cinnamon plantation. 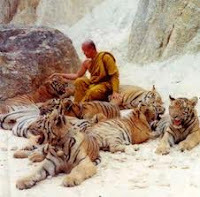 We would sit, chant, eat, poop, and sleep until one or more tigers arrive (I am told all eight could potentially make an appearance). There is also a variety of other wildlife in the area and additional trekking is available although I am not quite certain if this would interfere with the summons. The context in which all of this was communicated to me is difficult to describe. Obviously, there was a great deal of translation occurring but as I said above I have no idea what the guy from the restaurant is talking about 75% of the time so most of this I am piecing together from tidbits of information. There were long periods of silence. Long discussions between the two of them for which a translation was never rendered. And then my guy began sharing stories, opinions, perspectives, etc. in a manner I found completely incomprehensible. Something about how money cannot buy everything and about tourism and the relation between him and clients or friends or strangers. There is a guy from Argentina that stayed with him for ten days and only wanted to talk about Islam but he is already Muslim so why bother. He offered a little money but did not pay or something. He moved here and has wife but his sister was supposed to send money but no money. He start business but sister not send money and he go somewhere, maybe back to Argentina or something. The old man does not know me so he will only come into jungle for one day, maybe on the fourth day. And my guy will come also and we will eat sardines or noodles or rice or whatever I want. Something, something…tiger…what kind of camera…something, something…spirit man difficult..something, something. Confused? Well, now you know how I felt. And just to underscore the louche nature of the evening the host produced a few tiger teeth and a claw and suggested, I think, that perhaps I could fashion a necklace with them. Sooooooo not only should I violate an international treaty but I should also display that violation around my neck. I politely declined. I should have explained that I needed to save room in my bag for the ivory, rhino horn, and baby seal fur I would be acquiring on my way home. I doubt they would have appreciated that explanation as much as me. So I do not see a 15-day tiger summoning séance in my near future. I guess I will have to stick to the old fashion methods. Drat. This is hilarious! I hope you've got your tiger encounter by now.